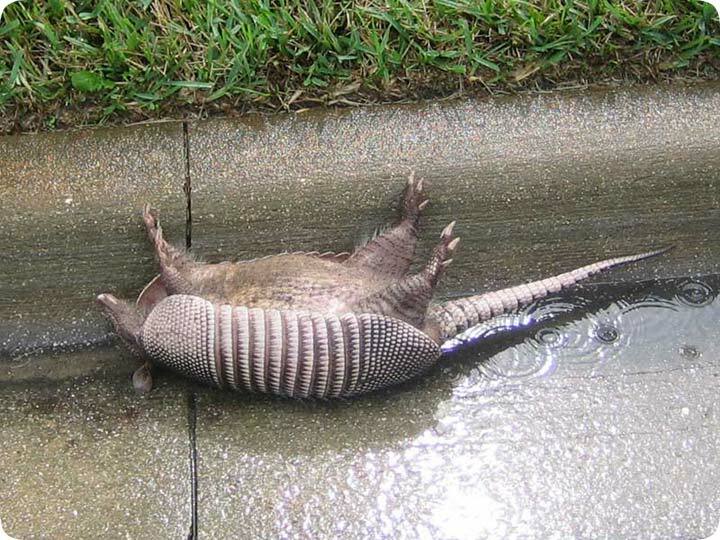 Roadkilled Armadillo - Hit by a Car. 10-21-2005 - "Why did the chicken cross the road? To show the armadillo that it could be done." Armadillos are amongst the most common of Florida's roadkill victims. Several factors contribute to this animal's tendency to become vulture fare. First of all, armadillos are particularly vulnerable because they are not alert. Some animals are ever-cautious and aware, always keen of their surroundings, sniffing the air, feeling vibrations in the ground, slinking off into the night before any chance of danger comes their way. Some animals bumble along through life, blindly stumbling over, across, and through any obstacle in their way, blissfully unaware of their surroundings. Armadillos fall into the latter category. In short, they don't look both ways before they cross the street. In fact, I don't think the animal looks at much at all, other than the patch of dirt directly beyond its snout. Thus, the animal blindly lumbers across our highways, counting on its shell to save it from danger. While the bony skin may work wonders against fox, it doesn't fare so well against a couple of tons of steel traveling at 60 m.p.h. Secondly, there's the matter of speed. Armadillos can run when they must, but for the most part, they're slow. Most creatures with shells (think turtles and snails) tend to the slow and steady lane of the critter expressway. Dillos are similar. They pretty much root around, scuffling along, plodding and poking, and rarely breaking into full sprint, which pretty much involves a series of quick, powerful hops. The slow speed of the animal, along with its tendency to wander back and forth rather than travel in purposeful lines, means that it spends quite a bit more time in our roadways than the average animal. If getting hit by a car means being in the wrong place at the wrong time, armadillos do all they can to extend that "wrong time" window as long as possible. If only they knew to quickly hop out of the wrong place, the road, quickly. This brings us to the third problem armadillos have with autos. When startled, the animal has a delightful tendency to jump straight up into the air. While this tactic may do a decent job of thwarting attacking predators, it also does a splendid job of facilitating the meeting of the animal with a car's undercarriage. So where a slow, steady opossum might watch a roaring car straddle harmlessly overhead, a startled dillo will leap upward to its death. As with any roadkill, there's the standard mix of automobiles and small terrestrial creatures whose territory overlaps roads. It's true that Orlando is full of both cars and armadillos.